I'd love for you to come join me for coffee at a local coffee house, St. Mark's Coffeehouse. What I really love about this place are the blue bottles lining the windows. I love it when I can find inspiration in places I frequent and I love colored bottles so these capture my attention each time I visit. while live classical music plays in the background. Just soak up the relaxing atmosphere with me and forget your worries for the afternoon. Thank you for this invitation! I enjoyed every morsel of the delightful food and the blue bottles are absolutely amazing! You had me at the bottles, but live classical music pushed me over the edge. Perfection. P.S. I love your new? blog design. What a chic coffee house. The food looks great and the blue bottles are pretty flashy... if only I could hear the music too!! I would love to join you at St. Mark's Coffeehouse! Everything about it is appealing. Great photos! It looks lovely there. I am suddenly feeling very hungry. I'm SO there with you !!! Those bottles in the window are so pretty - they must look gorgeous as the day changes light! Sounds heavenly and love the bottles!! Now I want to start my own bottle collection just like that! Anybody want to come and help me finish up those wine? hehehe! I wish I could come- looks like a great place! I love the blue bottles in the window. St. Mark's Coffeehouse sounds charming. The blue bottles in the window are so pretty. What a beautiful color! It would be nice listening to that music too. What a wonderful coffee house! The blue bottles are beautiful and the music must be wonderful, not to mention the coffee and food. The light in those blue bottles is amazing. What a super place - everything I love, the decor with the brilliant blue bottles, the live classical music, the frothy cappuccino, and the food....especially what looks like cheese and herb scones/biscuits perhaps, yummy! What a lovely place!! Love those bottles! I enjoyed looking through your beautiful blog and became your newest follower. Looking forward to seeing more. This looks like a great place! I think I could stay there for a long time! Love the blue too! I have a friend who is 'blue bottle' obsessed. I agree with you, inspiration is all around. What a great place to have a cup of coffee. I usually have a second cup around 3...almost time. What a wonderful place to be able to go! Love the bottles, the music, and the food looks delish! I'll be there in a few!! I want to go there! Blue, food and music! They thought of everything! I love blue wine bottles. Goodwill charges $3 for them! I need to raid the recycle bins and trash day! 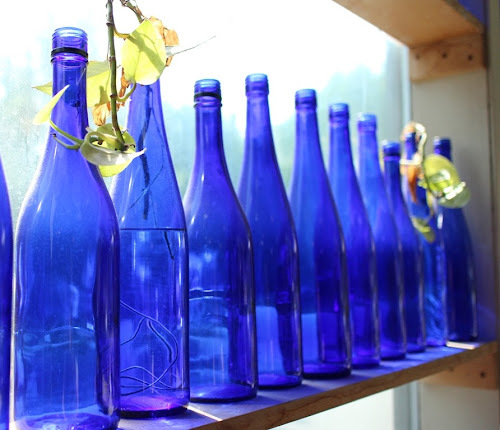 Beautiful Blue Bottles - makes a dramatic effect - very nice! What a lovely relaxing coffee shop, I would never want to leave. Love the blue bottles.